Pardon this late posting about our Halloween. With the election and my peak season, I’ve been monumentally distracted. Fortunately, the statute of limitations is a week, so we’re good. What a glorious night it was — we had the most perfect weather. This Halloween was the 5th anniversary of Max, Lyd, and Jo trick-or-treating together (Relish coverage extends back only as far as the 2007 outing). Granted, Jo wasn’t walking that first year, but he was still there! Jo is a rabid U-M football fan, and it was no surprise to me that he arrived as a Wolverine, ready to tackle all the candy in his path. As for older sister Lyd, it’s traditional for her to design her own costume. This year she assembled a marvelous witch-fairy get-up. Max went as Pikachu. Even though he insisted on wearing the officially-licensed Pokémon costume (much to my dismay), most adults had no idea what he was — and greeted him as a rabbit. True, the character has rabbit-like pointy ears, but Pikachu is actually a mouse (who just happens to be able to store electricity and discharge it in lightning attacks from his bright red cheeks). Not only that, he is the most beloved and popular Pokémon character out of nearly 500 Pokémon creatures. All this may sound very esoteric (I myself was quite ignorant about all things Pokémon 6 months ago), but Pikachu has been a prominent fixture of elite culture for years. For example, in 2000, Pikachu was featured in a “Got Milk” ad, and since 2001 he has had his own balloon in the Macy’s Thanksgiving Day Parade. In 2002, Pikachu placed 15th in the esteemed TV Guide’s 50 greatest cartoon characters of all time list — beating out such luminaries as Betty Boop, Scooby-Doo, Popeye, and — get this — Mickey Mouse! I wasn’t exactly on-board with Max dressing as Pikachu. Especially because the overly literal “store bought” costume included a plastic mask that would cover up Max’s face. Rico and I kept trying to convince him that not only would the mask become uncomfortable, it would make it hard for him to see (in the dark no less). But he was fully committed to the mask. In the end, it worked out. He was so electrified: a highly visible, yellow blur racing from one house to the next. And older kids were genuinely excited to encounter a favorite character from their past (“Wow, I love Pikachu!”). 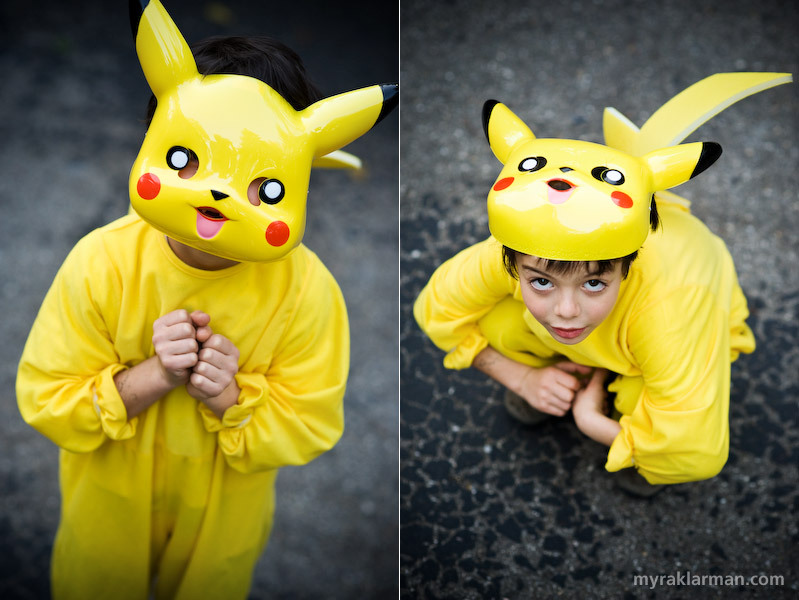 By night’s end, we were convinced that Max really was Pikachu. Rico continued his legacy of crazy costumes and went as Pippi Longstocking. 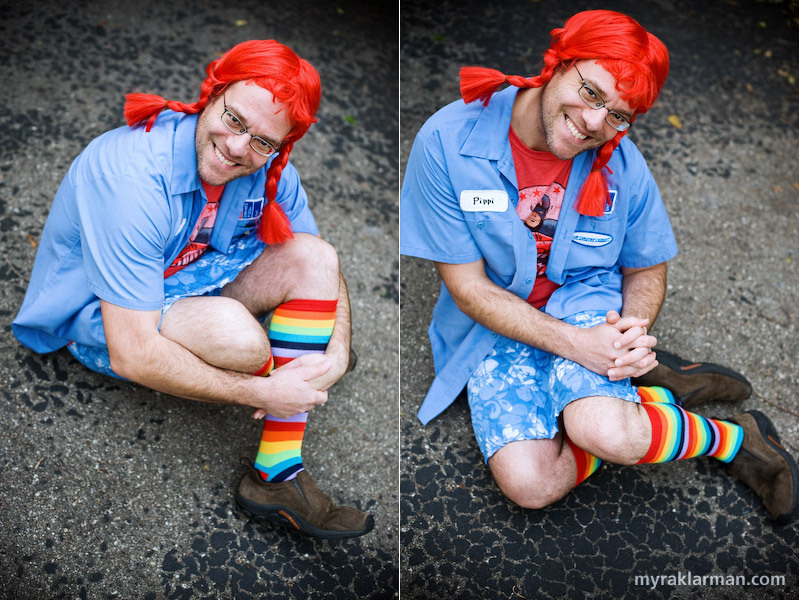 He wore shocking, bright red braids, some old clothes with patches on them, and knee-high rainbow socks. But about 50% of the neighbors thought he was Wendy, of square-hamburger fame. Wendy does indeed have bright red braids, but that’s where the similarities end. I present you with Exhibit A, with the warning that you may acquire a craving for hot, juicy burgers. Jo hails to the victors valiant, despite their poor record this year. | Lyd, an enchanting witch-fairy, always has me under her spell. The ever-radiant Pippi poses for senior pictures. 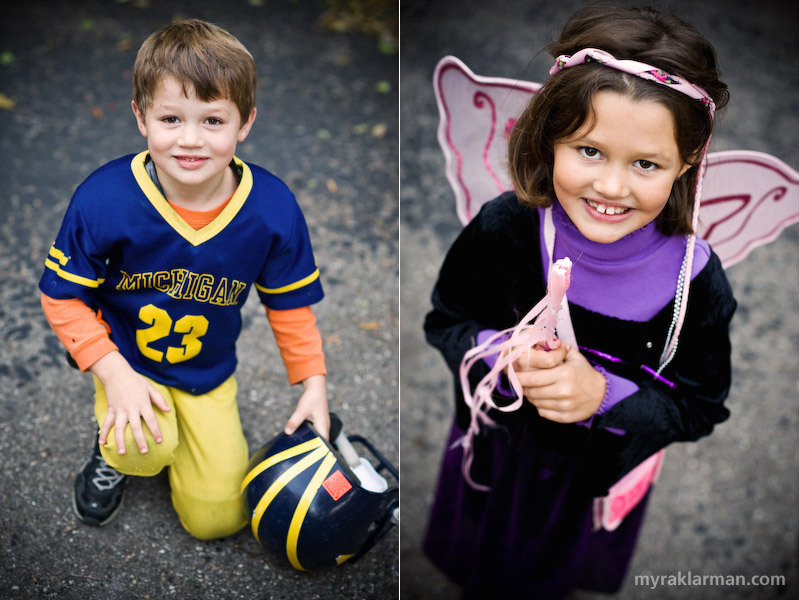 Earlier, I camped out on Main Street to photograph the adorable trick-or-treaters. Mo’ bigger photos can be seen at the Ann Arbor Chronicle. Max is pretty outrageously adorable, as are all the kids, but I must say that Wendy (I mean, Pippi) takes the cake. Love love love the stripey socks.